His limp body was seated on the side of the street. I watched as an occasional person would walk by and drop a few dollars while others would walk past carelessly. All I could feel was anger, a usual feeling when I was surrounded by his kind. I read the cardboard that sat in his lap. “I have no food and no money,” it read. As I pondered those words I couldn’t help thinking that, although he didn’t have anything, he still had something. His skin alone was an advantage for him. He didn’t have the past that I did. He was white. He was privileged. And in ways even more respected than me. My fury stimulated the steps that I began to take to the other side of the street, away from this nonsense. As I waited for the limitless flow of cars to come to a stop, my mind wandered to a common place. A place where I would recall the humbling site of my grandfather. Every Sunday, my grandfather’s raspy voice would belt through the church room as the hymns filled the ears of the people. He would never miss a single line of the song. Clinging onto each note like a rock climber on a cliff. His thick South African accent was prominent within his vocals. A light sparkled in his eyes as he listened to the readings, every inch of his body engulfed in the Mass. Each morning he would adjust his grey bow tie around his neck. I would watch, studying the intricate twist of his shaking fingers. His favourite colour was grey. He said it was the colour of unity. I never understood it at such a young age. After the stories of hurt. Talking about being driven out of his country by another race. All his birth rights being stripped away from him simply because the opposing force didn’t like his skin colour. How could there still be unity after that? I would ask myself. Moments like these were so important. Sitting around the ancient rocking chair my grandpa never left. Watching the rhythmic pattern, back and forth. Back and forth. Repeating itself, just like history. Never progressing. Listening to the story of hardships and torture. The unheard experiences of a black man. Or rather, uncared-for experiences. The passion within me growing and enlarging at each new story. I knew that it could never be forgiven. The pain caused. He would always tell me that he wished he could go back to his country. That South Africa was such a beautiful place but had once been ruined by the whites. They had invaded his country and taken over. Just as the Europeans had done in Australia. He said that’s why he had chosen this isolated continent. The two countries had that in common. He felt a connection, which made him feel at home when he was here. People like Mandela saved them from being overtaken completely, he would say. Then would go on to talk about how Mandela forgave them after all that had happened. But within me I didn’t feel mercy. Instead, rage would build inside me. All the terrible experiences he had to face, because of them. I could still see the vivid image of the scar across his stomach. A whip mercilessly thrashing him after accidentally finding himself in a ‘white suburb’. Now 20 years later, the passions still burning bright. Though the rocking chair is long gone, the stories never wither away. Always in the back of my mind. Some call it hatred. I call it hurt. I can still feel the stares when I walked into a petrol station at night. Part hatred, part fear. Having to watch my step. Being cautious so I didn’t look ‘sketch’. It’s funny that even after all that has happened in the past, I’m still judged. Fear the black man. Fear the one that’s been oppressed and tortured. Yes, I resented them. I wouldn’t make the same mistake Mandela did. Some things just can’t be taken back. You see, it’s crazy how one event can change your whole life. A complete domino effect until one decides to fall sideways and the rest of your life topples down in course. Skewing your entire perspective of life. Changing your existence altogether. So much impact all caused by one simple moment. One act. From a black man to a white man. An abrupt car horn sounded aggressively, pulling me back to reality, and as I began to leave, I heard a quiet plea from behind me. And that’s all it took. I couldn’t walk away from that. The desperation in his voice pulled me back and suddenly all sense of colour left me. Black and white melted away and moulded into one bland grey. It didn’t matter anymore the colour of his skin. He was a person in need and I was a person who could help. I recalled my grandfather’s favourite verse: Matthew 22:39, “love your neighbour as yourself”. And I could only remember his voice. Teaching me the importance of compassion and caring for others. Throughout the years, I had carried on the anger my grandpa had passed onto me, but from this moment on I would make sure to leave it there with the rocking chair. I had forgotten the positives and let the negative consume me. But that wouldn’t happen again. I handed over a note and, as I watched the light in the man’s eyes, I felt as if a burden had been taken away. A burden I had set on myself. Hatred that I let fill my life and take over my existence. Anger I had let motivate my every move. I watched our fingers touch. White against black. No. I would no longer allow myself to feel that way again. I would only see grey. This article was awarded first place in The Good Oil 2017 Young Writers’ Award, secondary student Years 7 to 9 category. 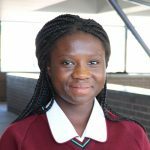 Abrafi Owusu-Mensah, age 12, is a student at Good Samaritan Catholic College, Hinchinbrook, in NSW, who spends her days mostly reading or dancing. She has "a strong love for English, but a great passionate hatred for all things mathematical".